Outwell and Upwell01945 772234work VillageThe villages of Outwell and Upwell lie around 18 miles south west of King’s Lynn and only 5 miles from Wisbech. In the Middle Ages they were collectively known as 'Welle' or 'Welles', and today they are absolutely continuous, so it is not obvious to a visitor where one ends and the other begins. Together they stretch about 4 miles along the old course of the Nene which is the main navigation link between the River Great Ouse and the River Nene which subsequently connects to the canal network of central England. Since the middle ages the landscape of the whole area has been much altered by the construction of several large drains which run through the parishes. Until the 1960s, Outwell and Upwell were also connected to Wisbech by the Upwell – Wisbech tramway, used for passenger transport until the 1920’s and freight until the last tram ran in 1966. After closure a preservation society arose led by the Reverend Wilbert Awdry, vicar of nearby Emneth who is best known today as the author of the Thomas the Tank Engine books. These attractive waterside villages provide a range of local services including shops, restaurants and pubs including the Crown at Outwell and The Globe and the Five Bells in Upwell. Both villages have waterside churches, St Peter’s in Upwell and St Clement in Outwell. For anyone wanting to visit the historic towns of King’s Lynn, Downham Market and Wisbech and for exploring the wide open landscapes of the Fens as well as the Wildfowl and Wetland Centre Welney, the villages of Outwell and Upwell offer an excellent base. 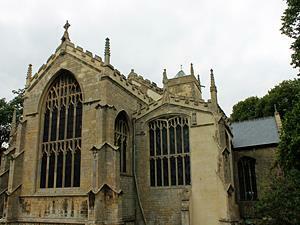 The villages of Outwell and Upwell lie around 18 miles south west of King’s Lynn and only 5 miles from Wisbech. In the Middle Ages they were collectively known as 'Welle' or 'Welles', and today they are absolutely continuous, so it is not obvious to a visitor where one ends and the other begins. Together they stretch about 4 miles along the old course of the Nene which is the main navigation link between the River Great Ouse and the River Nene which subsequently connects to the canal network of central England.